Colin Jost and Michael Che told Seth Meyers this week that they’re bummed about having missed out on the brief, weird saga of ousted Trump spokesman Anthony Scaramucci. But they made up for it Thursday on the premiere of “Saturday Night Live Weekend Update: Summer Edition,” with a surprise appearance by SNL vet Bill Hader as The Mooch. Scaramucci famously was hired as Donald Trump’s Communications Director, only to be fired 10 days later (before he officially assumed the position), after a disastrous week in which he failed to attend the birth of his child, his wife filed for divorce because, according to rumor, of his political ambitions, and he was humiliated after a bizarre, grudge-filled conversation with a New Yorker reporter was made public because the Mooch allowed it to be on the record. See a clip of the appearance below. Hader’s appearance was a fun taste of what could have been this fall when SNL returns, had the Mooch not gotten himself fired. 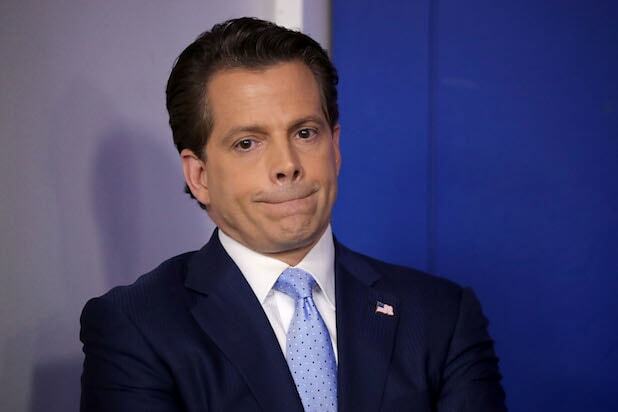 In fact, Scaramucci’s quick rise and fall not only robbed SNL of new material, it brought an end to one of the most popular jokes from the 2016-2017 season — White House Press Secretary Sean Spicer quit his job in protest after the Mooch was hired, meaning we’re unlikely to see Melissa McCarthy reprise her celebrated parody of him. “Saturday Night Live Weekend Update Summer Edition” returns next Thursday and the following two weeks. Now that Sean Spicer has resigned as White House press secretary, the fate of Melissa McCarthy's famed impersonation of him hangs in the balance. We've collected all of the comedy queen's Spicey moments on "Saturday Night Live" for you to hold onto for safe keeping. In the case McCarthy's first appearance as Spicer, she parodied his password mishap, his fondness for chewing gum and distorted facts to be favorable to President Trump. In her next appearance, McCarthy opened with "I am calm now... This is the new Spicey" (with an even bigger wad of gum). She also used Barbie dolls and a Disney Moana doll to explain the travel ban. In her Easter appearance, McCarthy, as Spicer, addressed his Holocaust snafu: "Spicey finally screwed up. You got me. I clearly meant to say ‘concentration clubs.’"
Before McCarthy's hosting appearance on "SNL," she battled New York City traffic as Spicer, podium and all. In this sketch, McCarthy hides in some bushes while he spies on Sarah Huckabee Sanders (Aidy Bryant). But when the reporters start saying they like Sanders better, an angry Spicer bursts into the room. "Spicey's back, Sarah's out." Also when McCarthy hosted the NBC show, she transformed into a Spicer costume set to "I Feel Pretty" from "Westside Story."